One in four people in the world will be affected by mental ill health at some point in their lives, according to estimates. Currently, about 450 million people are living with mental disorders. Depression alone is thought to affect more than 300 million people, while 21 million people suffer from schizophrenia and 50 million from Alzheimer’s disease. Approximately one person dies from suicide every 40 seconds, with indications that for every adult who dies, there may be 20 others making suicide attempts. Country-level mental ill health numbers are even more concerning. Together, China and India account for one third of the global burden of mental illness. Some estimate that 36% of the Indian population suffers from major depression. In 2012, 250,000 suicides were reported, with over 40% of these individuals under the age of 30. Among Indian women and teenage girls aged between 15 and 19, suicide has now surpassed maternal mortality as the leading cause of death. China accounts for 26% of suicides and is the only country in the world where the female suicide rate is higher than the male rate, with experts estimating that 25-40% more women are killing themselves every year compared to men. Healthy populations are the engine for sustainable growth. When such a large proportion of the population suffers from mental ill health, the negative impact is costly to society. People with severe mental illness die up to 20 years younger, have higher unemployment and are poorer than the rest of the population. 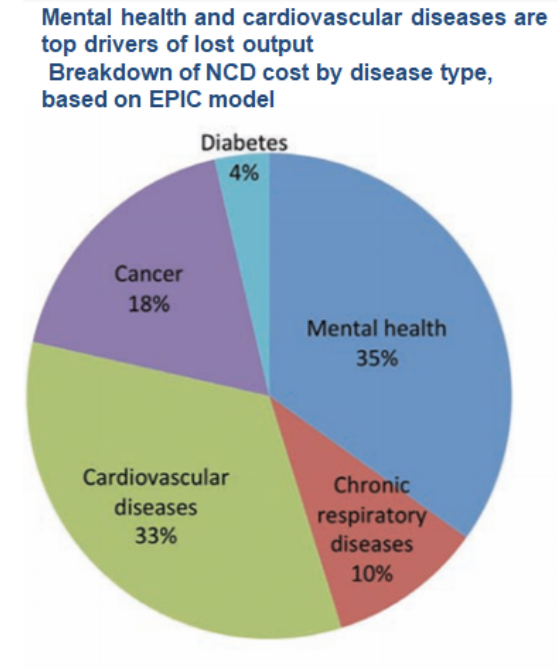 It is estimated that direct and indirect costs of mental ill health amount to over 4% of global GDP. This is more than the cost of cancer, diabetes and chronic respiratory disease combined. By 2030, mental illness costs are expected to reach more than $6 trillion annually. We are not doing enough to address this crisis. Despite these alarming costs, and despite research showing that for every $1 spent scaling up treatment for depression and anxiety, the return amounts to $4 in terms of better health and ability to work, between 76% and 85% of people with serious mental disorders have received no treatment in the previous year in low- and middle-income countries (LMICs). Low-income countries spend an average of just 0.5% of their health budgets on mental health, with the vast majority of the money going to hospitals that are more like asylums than adequate treatment centres. Mental health spending made up just 0.4% of global aid spending on health between 2000 and 2014. While recent years have seen a movement to treat and prevent non-communicable diseases, mental health has yet to make it to the global health agenda as an area or priority. It is time to fix our extraordinary failure to embrace mental health. Mental health happens wherever a person is. We believe global mechanisms will only make a difference if we also empower communities, including in workplaces, schools and homes, to provide good mental healthcare. However, a global-level consolidation of efforts is essential to address systemic issues affecting the provision of care. Public and private collaboration will be critical for success. Here are five priorities for cooperation in mental health. Mental health is a complex issue that requires collaboration among all stakeholders, including grassroot and community organizations, civil society groups, local and national governments, international organizations, private sector companies, religious groups and academic institutions. The private sector is a key stakeholder in this. Unfortunately, very few countries engage it formally in plans to address mental health provision, not even in its capacity as the biggest employer in most advanced economies. Coordinating stakeholders and connecting the dots among initiatives, including private sector activities but also advocacy, financing and campaign efforts (such as those being led by United for Global Mental Health), would go a long way to optimizing outcomes for individuals and their families. Progress has been made in recent years in leveraging data and technology to enable early and precision diagnostics. For example, some apps are able to use built-in cellphone sensors to collect information on a user’s typical behaviour pattern, providing signals that help is needed before a crisis occurs. These offer exciting opportunities, but raise the need to build governance systems that will guide the ethical and appropriate use of such technologies to enable positive outcomes that matter to the patient. Successful mental health treatment should combine behavioural and psychological interventions with other medical ones when appropriate. Unfortunately, many of those who need treatment do not receive it because they live in areas of low access, or simply cannot afford medication. It is estimated that about 75% of people in LMICs have no access to mental health treatment. Even in an advanced economy such as the US, it is estimated that one in five adults with a mental illness are not able to get the treatment they need. And this alarming number only includes individuals who are actually seeking treatment but facing barriers to getting it. Furthermore, there has been significant divestment from brain research in the past few years, and the number of drugs being developed for brain diseases has halved since 2010. As a result, for many mental health conditions, either very limited or no drugs currently exist to defer, slow or improve symptoms. This is notably the case for Alzheimer’s disease, even though the number of individuals affected by that disease globally is expected to increase to 100 million by 2050. By then, the cost of Alzheimer’s care is set to reach $1 trillion in the US alone. Moving the needle to encourage brain research, the development of novel pharmacological and non-pharmacological therapies and better access to treatment for people living in low-resource and low-access settings would go a long way to improving mental health outcomes. Pathways for mental healthcare tend not to be clearly defined, implemented or standardized across care centres. They also do not always reflect relationships between stakeholders, variability of illness and patient individuality. For example, psychiatric and psychological services are often not integrated. Furthermore, mental disorders are often not included in reimbursement schemes, resulting in individuals being faced with daunting financial consequences for seeking mental healthcare. Self-reported data from 177 countries in 2017 shows that less than 70% of these states explicitly list severe mental disorders in national insurance or reimbursement schemes. Twenty-seven percent of countries reported that mental care and treatment are not included in national health insurance or reimbursement schemes. Of those, 19% explicitly list mental disorders as excluded conditions from the national health insurance and reimbursement schemes. An evidence-based yet flexible approach to treating mental ill health that is consistently deployed, appropriate to country-level cultural context and covered under national insurance schemes would ensure that everyone who enters the healthcare system for mental healthcare is treated appropriately and not put at risk of financial hardship. There is a dearth of mental health workers, including psychiatrists, psychologists, nurses, social workers, occupational therapists and other paid mental health workers, in both emerging and mature economies. The 2017 WHO Mental Health Atlas revealed that median numbers of mental health workers per 100,000 population vary from below two in low-income countries to over 70 in high-income countries. The global median is nine per 100,000 people. That’s less than one mental health worker per 10,000 people. In comparison, Washington DC has a higher ratio of Starbucks coffee stores. Furthermore, mental healthcare needs to happen on the community level. More non-specialists should be trained to deliver basic care to those who need it. For example, an innovative programme in Zimbabwe, The Friendship Bench, trains grandmothers to provide problem-solving therapy to people suffering from common mental disorders, with encouraging success. Building on the strength of communities to deliver mental health in the patient's immediate environment would sustainably improve lives. The World Economic Forum is committed to coordinating global efforts in this space by harnessing the recent momentum from a multisectoral global community on mental health. As we look ahead to our Annual Meeting in January 2019, to the global calendar of events on mental health and to our programmatic activities throughout the year, we seek to create impact in the above areas. We also seek to contribute to global efforts on advocacy and stigma reduction by normalizing conversation about mental health and socializing the message that all of us, at all times, have mental health. This first post in a series on unpacking and tackling global mental health challenges provides an overview of the issue, as well as some ways in which public-private cooperation is critical. It’s time to recognize, acknowledge and understand the complexity of mental health, create opportunities and solutions to improve the lives of millions, and redefine humanity. It can be done. The time to act is now. Written with input from Peter Varnum, Project Lead for Global Health and Healthcare at the World Economic Forum.